Minor traffic disruptions will be experienced in Barkly Street (between Vincent and Queen Streets) on Monday, December 11. The Town Hall in Ararat is being redeveloped as an Arts Precinct, and requires the hydrants fronting the development on Barkly Street to meet minimum fire-fighting standards. The hydrants no longer meet this standard, although they did in 2013. 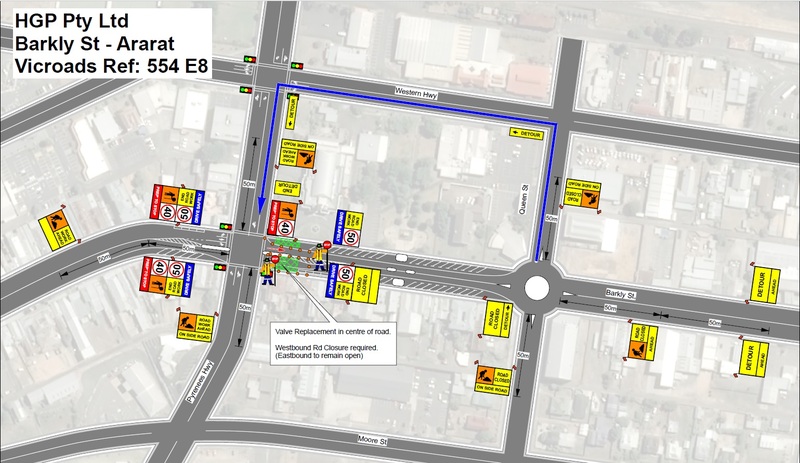 Based on flow and pressure tests a restriction in the water reticulation is identified near the Barkly Street and Vincent Street road intersection. GWMWater is conducting works, with a contractor required for the proposed removal of likely corroded valves and fittings. New valves and a hydrant are proposed in locations that are more accessible. A section of the road will be closed (see above map) during the day on Monday, December 11 while bitumen and exposed pipe and fittings are replaced. As up to 70 water customers in the Ararat CBD may be affected by these works, GWMWater has proposed that the water supply interruption is scheduled outside of business hours, which will occur between 7pm and 2am on Wednesday, December 13. A section of the road will again be closed on Monday, December 18 while the road is repaired with hot mixing throughout the day. For further information contact GWMWater on 1300 659 961.